This adventure in baking my way through Martha Stewart's Baking Handbook is brought to you courtesy of my friend's pick on facebook. His random page selection was for Key Lime Tart with Candied Key Lime Slices, how fancy sounding. My introduction to key lime dessert is not nearly as fancy. It all began one late night when I was sixteen and first tasted key lime pie at the local Denny's. My young, inexperienced, very finicky palate was hooked on that bright green, creamy concoction from the first forkful. 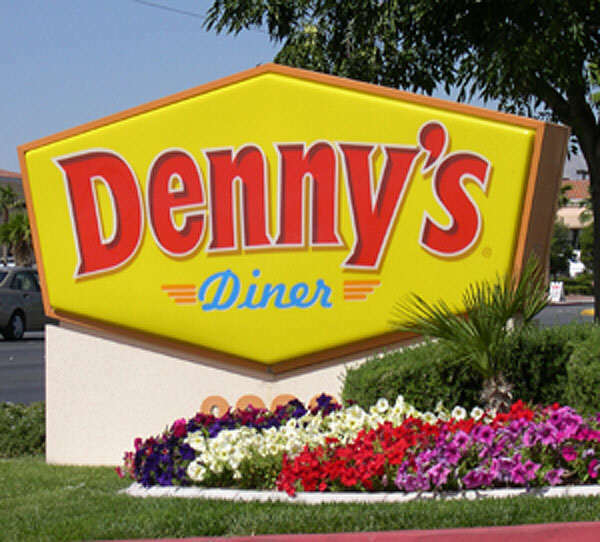 Did you know you could buy a whole pie from Denny's? You can. And I did. Often. I even took them to parties. I was seriously obsessed with that pie. It wasn't until a few years later that I came to understand all key lime pie was not like Denny's. Or that it wasn't even supposed to be green. Or that some people prefer it with *gasp* meringue! The horror! As I matured in age and taste buds I began to appreciate real key lime pie. It is one of my favorites. My man likes to bring me home slices from all over town if he's at a late business dinner. 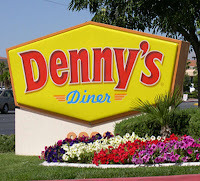 I've not been in a Denny's but once in the twelve years I've been a vegetarian. I'm not even sure if my first pie love is still in the frosty dessert case. I'm going to admit I'm not a pie baker. It's the crust that gives me heart palpitations. So I was happy this wasn't a pie but a tart so I wouldn't have to fuss with dough. However, after I read the recipe I realized Martha did want me to make my own homemade graham crust from a DOUGH! What? I considered it. But after frustration finding another rare ingredient not clearly labeled such. *deep, calming breath* I nixed Martha's suggested crust. I rationalized this was acceptable change since I will still have to make the Graham dough when I bake the homemade Graham Crackers in the Baking Handbook on page 90. Now what crust should I do? A google search led me to this pretty blog for the same recipe but a different crust. I used hers and I was very pleased. This was such a brilliant crust for key lime pie. The addition of key lime zest is inspired. Thank you, Evan, whoever you are. Mix all ingredients and press into 9-inch tart pan. Bake at 375° for 7 minutes. Cool completely before filling. The cooling crust. Can you see the flecks of lime zest and grains of sugar? Make crust from recipe below. Let crust cool completely. Preheat oven to 350°. In the bowl of an electric mixer fitted with the whisk attachment, beat yolks on medium-high speed until pale and fluffy, 2 to 3 minutes. Add condensed milk, lime zest, lime juice and salt, and beat to combine, about 1 minute. Pour filling into cooled crust; bake until set, about 10 minutes. Transfer tart to a wire rack to cool. Once completely cool, loosely cover with plastic wrap; refrigerate until chilled, at least 1 hour or up to 1 day. When ready to serve garnish with candied Key lime slices and serve with whipped cream on the side. It takes a lot of tiny Key limes to make the required amount of lime juice. The cooling pie. Nope, not green. Amazing texture flecked with dots of lime zest. In a 10-inch sauté pan, bring sugar and water to a boil, stirring constantly until sugar dissolves. Reduce heat to a gentle simmer. 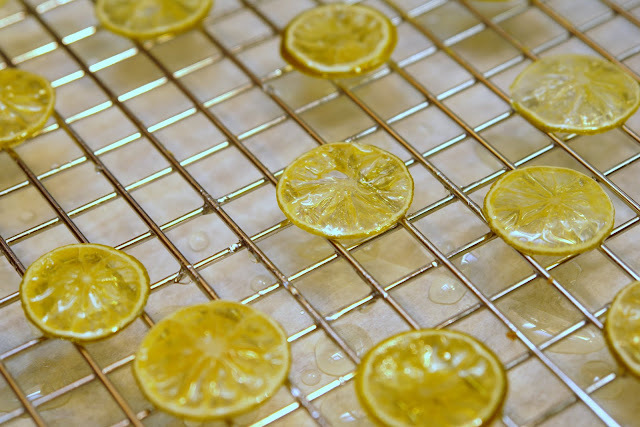 Add lime slices in a single layer, arranging them so they do not overlap. Cook until white pith is translucent, 30 to 40 minutes, turning slices two or three times during cooking. Using a slotted spatula, carefully transfer to a wire rack to cool completely before using. The resulting tart was tasty. Not very sweet. The candied lime slices were pretty but inedible. Did I not cook them long enough? I would make the tart again, perhaps mini tartlets and forego the labor intense candied lime slices in favor of some homemade whipped cream alone. 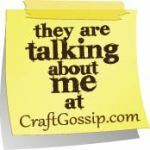 My next door neighbor didn't finish his slice, sighting it was too tart. To which his awesome wife quipped, "it is a tart." Sadly my friend this was baked for was not able to receive it since his daughter came down with pneumonia and the scheduled kiddo play date was canceled. To soothe the pain, I'm planning on baking him Black and White Cookies for the next time we meet.